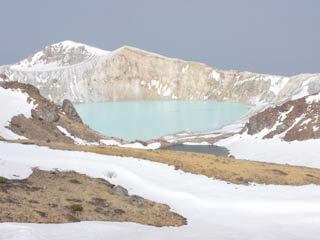 Lake Yugama (湯釜) is a caldera lake located on the top of Mt. shirane. It is 300m wide and 30m deep. It has the strongest acid water (ph1.0 ~ 1.2) in the world. It looks light green, but the water does not contain such a color. Many people visit during the hiking season. You cannot visit near from this lake. It is very dangerous. There is a observatory from the top of the Mt. Shirane. 1. use bus to Kusatsu Shirane Resthouse. It is an active volcano. It still erupts sometimes. Last eruption was 1983. The water has no green color, but because of dissolved iron and brimstone take the light wave of other colors.